The Gutenberg Bible: Book of Joshua. The present 13 continuous paper leaves comprise the complete Book of Joshua from a copy of the first printed Bible, volume I, fol. 102-114. Incunable – Rubricated, headlines, chapter numbers and Lombard initials supplied in alternating red and blue letters, versals touched in red. Two initials cut, restored in facsimile, missing text and initials replaced. See our video presentation of this book here. 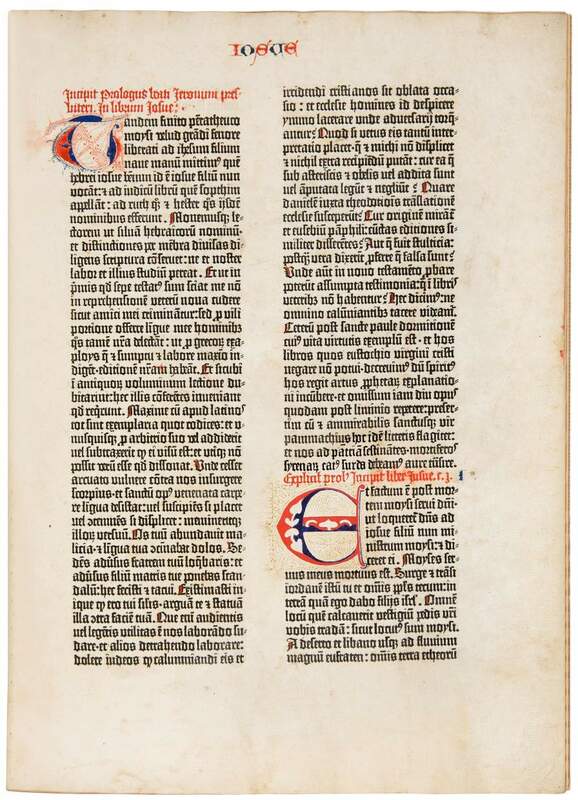 The Gutenberg Bible, the first printed edition of the Latin Bible and the first substantial printed book of the Western World, is a work of art whose majestic craftsmanship has never been surpassed. Other technicians had also been searching for ways to produce some form of mechanical script, but only Johannes Gutenberg (c. 1397-1468) resolved and synthesized the innumerable problems into an ingenious, workable method that became standard practice for the next 350 years. The invention of printing with movable type caused a sociological and structural transformation of unknown dimensions in Europe. Without Gutenberg's invention - this was often enough emphasized - Luther's Reformation would not have been as successful and groundbreaking as it turned out to be. The Gutenberg Bible was printed in two volumes containing 1284 pages in total, probably using a 14th-century Vulgate Bible manuscript as a model, very much like those common at the university of Paris, thus the Bible version that was most widely spread all over Europe. It is set in two columns of Gothic type designed in a late Gothic textura, as traditionally used for liturgical manuscripts. From the number of lines per column this edition is named the 42-line Bible (or B 42), in order to distinguish it from the 36-line Bible, which appeared a few years later. The Gutenberg Bible was printed in an edition of probably thirty-five copies on vellum and 150 copies on paper. Some forty-eight copies have survived, of which only twenty are complete.